Thanksgiving is one of those food centric holidays, perhaps even more so since historically is has been celebrated to commemorate a meal shared with the Native Americans. There are many recipes that children can make for the holiday. This page contains Thanksgiving recipes for kids. This year my daughter's fifth grade class put on a Thanksgiving meal for their parents and teachers. Each student picked a recipe and brought it home to make or help make. At first I was a little irritated. My daughter chose, of all things, Indian pudding. Of course this dish is best served warm so that left me to cook it, and have it to the school in time. Now I am glad that I did! It was so good! "Almost every happy memory the New England colonists had of their former life in England revolved around some festive occasion, one that was often celebrated with rich pudding. During their early years in the New World, the colonists could only dream of the plum puddings of Old England. Even a simple milk pudding or bread pudding seemed out of the question because of the absence of wheat flour. But there was, of course, Indian cornmeal. With the increase in the number of dairy cattle brought to Plymouth Colony from England during the late 1620's, milk and milk products became somewhat more plentiful and the Pilgrims could begin to approach the idea of an English-style milke pudding. Wheat flour was still scarce, of course, so they used cornmeal instead and called the new creamy, baked dessert "Indian" pudding, even though it contained such non-Indian ingredients as milk, eggs, butter, molasses for sweetening, and pinches of such exotic spices as cinnamon and ginger. Thick cream, when available, was poured over the pudding - another non-Indian and distinctly English touch. The molasses that went into the New England Indian pudding was a special case, for it was neither British nor American Indian in origin. It was the product of Yankee business enterprise as expressed through the New England sea trade." Set oven to 300 degrees fahrenheit. Pour milk into a medium-large saucepan and heat over medium-high heat just until the milk is scalded (tiny bubbles will appear around the edge). Watch carefully so that milk does not boil. Butter a one-quart casserole dish or other deep baking dish. Pour mix into casserole and bake at 300 degrees for 45 mins. Serve Indian pudding warm. Heavy cream may be poured over top. Although not traditional, a scoop of vanilla ice cream is an especially good topping for a portion of Indian pudding. The kids at school used Cool Whip and it tasted so good! 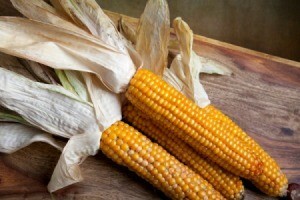 Need a fun recipe using corn to send to 1st graders Thanksgiving feast! The cutest one we used was to take clear see-through plastic gloves (get a 50 count package at Everythings a dollar store), drop a candy corn into each finger to look like a finger nail, then fill with popcorn and tie off the end of the glove with a ribbon. fun, fun for kids. For a recipe using real corn, corn on the cob is about as easy as you get I think, instead of a large ear of corn on cob, cut the ear of corn on the cob into small pieces that are fun to eat. Children love to eat small cute things that are messy and fun. You could put an individual pat of butter with each mini ear of corn if you like.